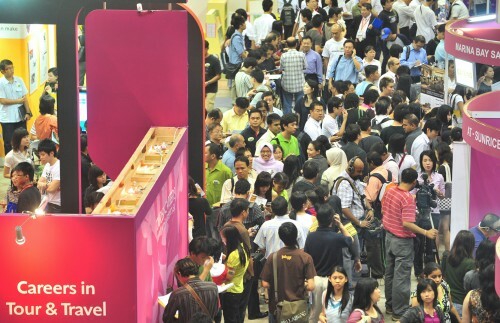 Manpower Minister Lim Swee Say yesterday assured Singaporeans that there is continuing creation of jobs in the country. He is the third government leader in two days to stress the availability of jobs amid news of rising layoffs and a slowing economy. Mr Lim also reiterated the call for workers to adapt to transforming industries by picking up new skills to take on new jobs. The Government is ramping up efforts to train workers, too. On Thursday, Health Minister Gan Kim Yong and Acting Education Minister (Higher Education and Skills) Ong Ye Kung had pointed to the thousands of job vacancies in such sectors as healthcare, IT and precision engineering. Yesterday, Mr Lim highlighted the continuing flow of investments here. "Every day, every week, every month we are attracting new investments to create new jobs," he told reporters at a career event for the information and communications technology (ICT) sector. He also announced two new programmes that would better match workers to available ICT jobs and give career guidance. At a separate event last night to mark the 75th anniversary of professional services firm KPMG, Mr Lim urged businesses to do more for low-wage workers by supporting progressive wage practices. KPMG also launched a Progressive Wages Pledge to undertake to raise the wages of its lowest-paid workers through training and job redesign.